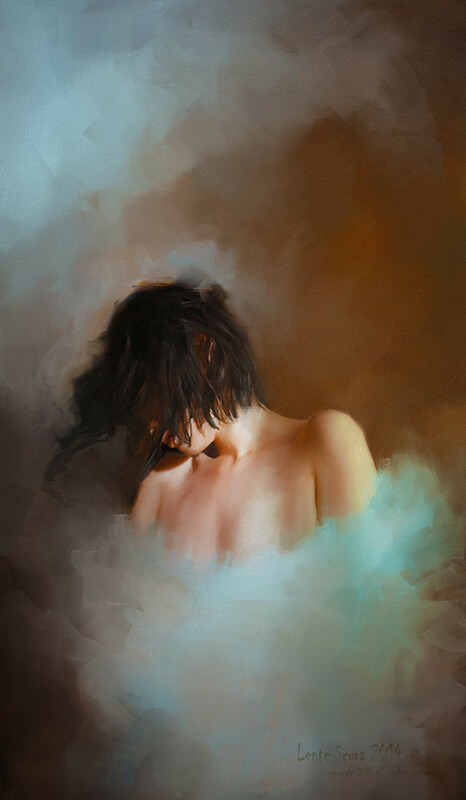 Lente Scura is a digital artist who uses photo-manipulation and digital painting to create emotive digital paintings of subjects struggling within emotional states and dream-like environments, taking the viewer on an emotional journey through visually striking digital compositions. Filled with dramatic anguish, each figure appears to be struggling with the complexity of emotions. As the human forms melt away into a confusing blur of reality and dreams, there is a haunting presence of imminent death within the life of each figure. Each work is composed of a process of photo-manipulation and digital painting to show the figure struggling to survive in a sea of sorrow. To convey the emotional message, the artist focuses less on the details and more on the energy that emanates from the canvas, inviting the viewer to reflect on the intense suffering and emptiness surrounding each delicate form.